RYAN GETZLAF scored the first goal for the Ducks in their 4-2 win over New Jersey Sunday night (Flickr/Bridget Samuels photo). Bookended by a couple of goals each in the first and third periods, the Anaheim Ducks defeated the New Jersey Devils 3-2 on Sunday at Honda Center to break the tie for third place in the NHL Pacific Division. The win not only gives the Orange County team a 37-24-12 (86 points) the inside track for the last guaranteed Stanley Cup playoff berth, it cripples the chances of the Devils (37-27-8, 82 points) to make the post-season as well. Scoring for the Ducks were Ryan Getzlaf, Jakob Silfverberg, Brandon Montour and Rickard Rakell. John Gibson had 15 saves in goal. 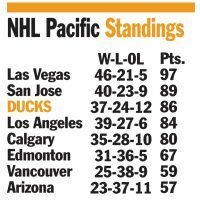 With nine games remaining on the schedule, the Ducks will seek to tighten their grip on third place in visiting the Calgary Flames (35-28-10, 80 points) on Wednesday. Death penalty for drug trafficking?